125 delicious recipes that adhere to fitness phenomenon Mark Lauren’s unique “calorie shifting” nutritional philosophy to help you cook your way to weight loss, muscle gain, and improved fitness performance. Just as you don’t need a fancy gym membership to get the best workout of your life, you don’t need fancy kitchen skills or a personal chef to keep your body optimally fueled. You Are Your Own Gym: The Cookbook capitalizes on ingredients that are fresh and affordable, and simple preparations you’ll want to make again and again. Categorizing meals as either fast-fueling or slow-fueling (depending on the carbohydrate content), Lauren’s recipes cover your needs for breakfast, lunch, dinner, snacks, smoothies, and even dessert! 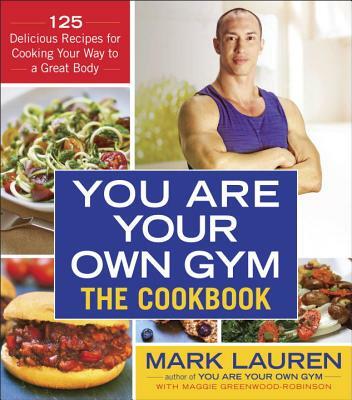 Filled with tempting photos of delicious meals, handy shopping lists, and sample menus to help you fulfill all your fitness goals, You Are Your Own Gym: The Cookbook is your best bet for building a stronger, leaner, healthier you with each satisfying bite. Mark Lauren spent fifteen years as a military physical-training specialist for the Special Operations community. Now a sought-after personal trainer to civilian men and women of all fitness levels, a triathlete, and a champion Thai boxer, he is the author of the internationally popular body-weight bibles You Are Your Own Gym, Body by You, and Body Fuel. He lives in Tampa, Florida, and Phuket, Thailand.